This trip has been discontinued. Instead see the other suggested itinerary for France. Revel in a "joie de vivre" like only the French can as our France vacation package brings out the artist in you. Tour magnificent locations that have served as the inspiration for great masterpieces — as well as the backdrop to history. Bienvenue! Welcome to Charles de Gaulle International Airport. An Adventures by Disney representative is there to greet you and help you with your luggage before you are transferred to your hotel in regal Versailles. After your Adventure Guide checks you in, settle in at this woodland retreat nestled beside the tranquil Royal Domain of Versailles, less than a mile from Louis XIV's world-famous chateau. Steeped in tradition yet thoroughly contemporary, this hotel features a sumptuous décor and well-appointed accommodations. Gather with your fellow Adventurers for a welcome reception and dinner at the hotel. Sate your appetite with a delicious buffet of local and regional French cuisine as you sip that world-famous wine. Our local expert leads you on a privately guided tour of the opulent Palace of Versailles. Be dazzled by the extravagant décor of this historic home to the Kings and Queens of France, including the legendary Marie-Antoinette. Admire the extravagant vaulted ceilings canopy ornate rooms with gilded royal portraits and sculptures. Peer through windows that look out over sophisticated gardens with immaculate topiaries. As you stroll through the dazzling Hall of Mirrors, reflect on the bygone glories of French royalty. After basking in the grandeur of the Palace of Versailles, adjourn to its South Wing for lunch at the quaint Le Grand Café d' Orléans. Visit the home of this great Impressionist painter and discover its tranquil gardens bursting with vibrant blossoms and luxurious, leafy trees. Take the coach to your home away from home for the next 3 nights: the Royal Barrière Hotel. This majestic gem crowns the prestigious beach of Deauville, a refined getaway that offers a hushed ambience for discerning travelers. For dinner, select from some of Normandy's exquisite cuisine. Indulge in fantastically fresh seafood and salads, as well as creamy cheeses, mouthwatering apple desserts, hard cider and the celebrated apple brandy, Calvados. Feel free to ask your Adventure Guides for restaurant recommendations. The silhouette of this formidable island fortress looms on the horizon as your coach approaches. Surrounded by a venerable town, this medieval Benedictine abbey was built in honor of the Archangel Michael who, according to medieval legend, will slay the dragon at the Apocalypse. With a local guide, explore rooms such as the ancient scriptorium, ossuary, chapel and crypt. Feel the island's enchantment as you wander down winding cobblestone streets on your own trek through town. The rhythmical beating of eggs in copper mixing bowls can be heard down the street, beckoning hungry visitors to try one of their world-famous omelets! Feast on an enormous, fluffy omelet and other regional favorites at this quaint, yet historic, restaurant. Climb aboard the coach for a ride to Les Vergers de Ducy orchard, where you will tour the orchard and cider production areas. After sampling a traditional pudding dish native to Normandy, taste delicious cider and the simmering sweetness of Calvados, an apple brandy. Known as the "lady of the French coast," Deauville awaits with its stylish restaurants and bustling nightlife. Return to your hotel from the orchard and explore this upscale resort town before enjoying le diner. If you need restaurant recommendations, your Adventure Guides can help find the perfect meal for your family. Travel to Bayeux to see the astonishing Bayeux Tapestry—a 224-foot (68-meter) embroidered cloth that tells the story of the Norman conquest of England in 1066. This quiet waterfront hamlet nearby Omaha Beach played an important role in the Allied invasion during WWII. Have lunch at your leisure in this delightful seaside village. If you've not yet had a traditional French crèpe, here's your chance to visit an authentic French crèperie. Indulge your inner boulevardier as you stroll past romantic Belle Époque villas on the beachfront boardwalk of this suave seaside resort. Deauville is a year-round playground for the French elite, abuzz with film festivals, regattas, golf tournaments, jazz—and world-famous thoroughbred racing at the Hippodrome. End the day curled up with your petits as you are treated to a private showing of a Disney movie. 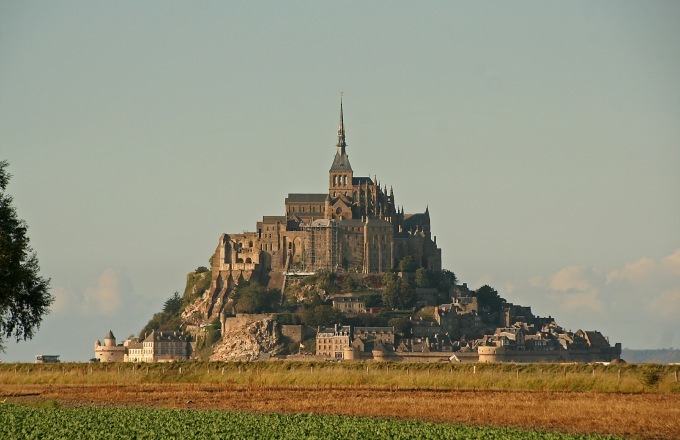 Travel by coach to this historic and picturesque Normandy fishing town. Like Monet and Boudin and other great Impressionist painters, you will join in the vibrant throng at the Honfleur open air market, a haven of artisanal pâtisserie, cheeses and fresh fruit, and then enjoy lunch on your own at the market or a nearby café or restaurant. After lunch, reconvene for a panoramic tour of The City of Light, with a photo stop at the Trocadéro, directly across the Seine from the Eiffel Tower. Steps away from the Champs Elyseés, the Hotel Napoleon features an Old World décor with modern amenities. Relax as we check you in at these elegant accommodations, where you'll stay for the next 3 nights. Dine on elegant French fare at your leisure at this world-renowned Champs-Elysées restaurant and bakery. Ladurée is legendary for its delectable macarons in a multitude of flavors. Delicieux! Soar toward the stars for a sky-high experience you and your family will never forget! Embark on a walking tour of the top 2 levels of this Parisian icon and discover the "heights" of art. Now's your chance to venture out and experience the grand French ritual of le dîner! Your Adventure Guides will help you find the perfect restaurant for an extraordinary family meal as only the French can create. *Activities for this day, including the Batobus boat, L'Open Air double-decker bus, and Disneyland Paris, are not included and are available at an additional cost. After breakfast you'll get to experience the enchantment of Paris like a true native—on bicycle! There are 270 miles of bicycle paths and routes in Paris. Adventure Guides will chaperone you on a breezy tour of scenic icons like the Louvre, the Tuileries and the Arc de Triomphe. Continue your exploration of Paris as you spend the entire afternoon as you wish, shopping, sightseeing or simply watching passersby at a charming sidewalk café. Dine in the height of elegance in a private room at the Louvre overlooking the famed glass pyramid entrance in the Cour Napoléon. Bid your fellow adventurers a bon voyage as you enjoy one last meal in Paris. Board pre-arranged transportation to the airport and say au revoir until you return!